At LDI 2008, we had the chance to connect with the former LD for Lakewood Church, as he began his new position at SeaChanger Ocean Optics. Bringing with him a wealth of experience and technical prowess, he became an appropriate person to put together some lighting tips for TFWM. We are pleased to have him on board to shed some… to give authoritative direction on some basic lighting concepts. After designing and operating shows for many years, it just happens without any thought. For me, trying to explain the process is more difficult than actually designing a show. – What are we lighting? – Is it a traditional or contemporary service? – Will there be worship with a full choir or just a band and vocalist? – Will there be a sermon with a special look? – Are there projection screens, internet streaming, or TV broadcast? – What existing equipment is available? – What is the ceiling height and what are the throw distances? – What are my power/dimming constraints? – Do I have the correct hanging positions? – What is the budget? Once these questions are answered, the process can begin. – Floor: Altar calls, prayer time, etc. – Effect: intelligent lights, color changers, gobos, etc. Try your best to keep layers isolated from each other, to give you the most control. I tend to start with the first layer (floor) and work upstage. I suggest adding the appropriate fixtures for front and backlight. Par 64 are good for this, since they will cover a large area, they are inexpensive and most facilities have plenty of them. I use a light frost on the front light to blend in the edges. Preaching is lit with ellipsoidals for the control aspect. Start in the center (at the pulpit, if there is one) and place a fixture every 3-4 feet until the desired area is filled. To get a sense of evenness, place the beams in tight focus, crop the edges and add a light frost. I use a lighting meter to ensure the overlay is at the same intensity across the area. Performance area, as in down and mid-stage, is lit the same way and will be able to utilize the preaching area. Band lighting is done once the position is determined. If they are in a pit then pars can be used to light the area. I like to use ellipsoidals to isolate each member. Doing this allows me to “highlight” solos and create separation from the other areas. Back light can be done with pars, and color can be added. For Choir position I use either pars or fresnels if available, and again for backlighting the choir I use pars. The set and effect lighting usually takes the most time and equipment. It can also be difficult to explain how to light. The set can consist of several elements, including columns, curtains, risers, walls, etc. 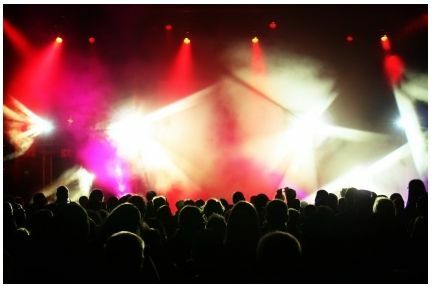 Using effects such as intelligent fixtures, gobos, LEDs and color changers can greatly enhance the overall production. Of course with any production there are smaller details that need to be addressed, but this is a good way to start your process and create you own style. What works for you? What challenges are you running into? Once we get your feedback from this article, together we can determine different situations and scenarios and talk about them. Best of luck to everyone during your Easter productions- chances are there will be stories to share and lessons to impart. Most importantly- experiment and have fun!